The U.S. needs to stop propping up the criminal Jovenel Moise regime and let the Haitian people determine their own future. 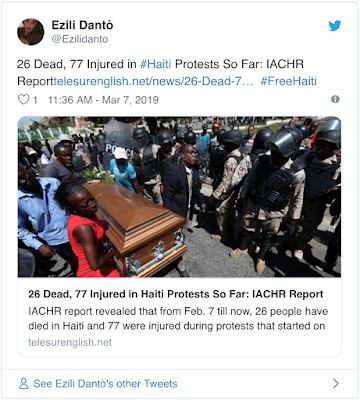 See, Èzili/HLLN photo Album for the picture essay on this story about how the West, billionaire Haiti oligarchy and its puppet Haiti government hires mercenaries to silence Haiti protest to their repression. Write Paula A. Wolff of the DOJ; ask her why is your department flaunting the rule of law? 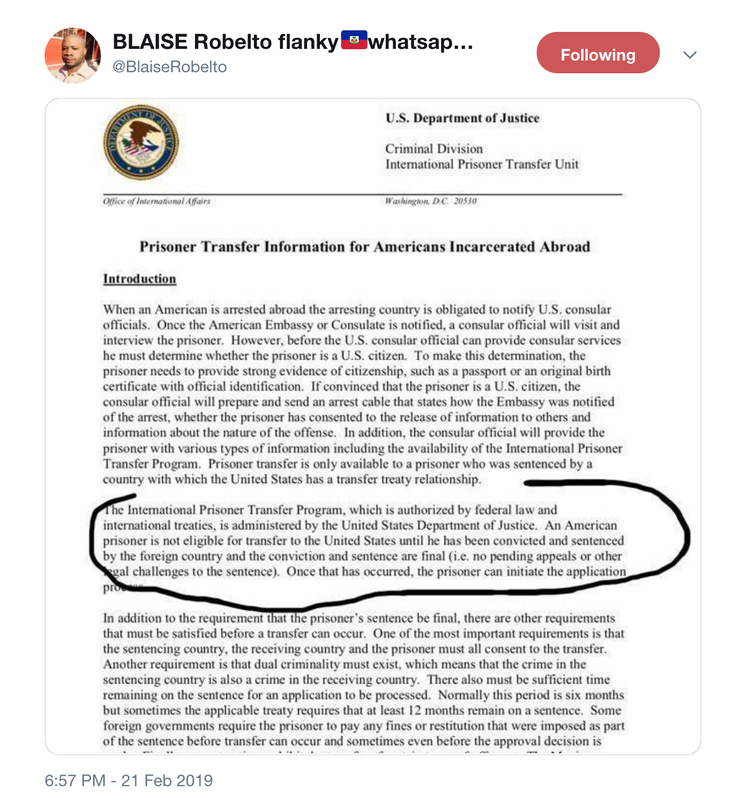 "For additional information or questions about the International Prisoner Transfer Program, contact the International Prisoner Transfer Unit (IPTU) at the Department of Justice." Understand that you are subject to the local laws and regulations while visiting or living in the country – follow them. Learn which laws might be different from the laws in the United States. We provide some information for each country on our Country Information pages. 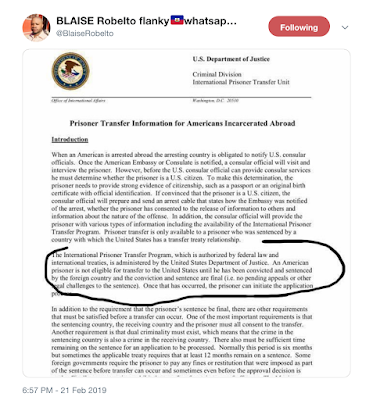 For more information on a specific country’s laws, contact that country’s nearest embassy or consulate in the United States before you travel. Follow Zili on Twitter, Facebook, Instagram or subscribe to her website ezilidanto.com and listserve/newsletter. Human Rights Lawyer, Ezili Danto is dedicated to correcting the media lies and colonial narratives about Haiti. 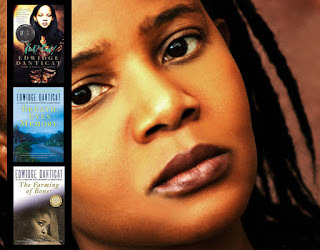 An award winning playwright, a performance poet, author and lawyer, Ezili Danto is founder of the Haitian Lawyers Leadership Network, runs the Ezili Danto website, listserve, eyewitness project, FreeHaitiMovement, the on-line journal, Haitian Perspectives and Zili Dlo, an Ezili Network project for clean water, renewable power, cultural education and skills transfer for Haiti. Visit her at Ezilidanto.com and donate to the cause here! Thank you. same amount he donated to HRC's campaign. "USAID Go Home" is a 1996 article on the Third World Traveler website (still relevant today) and what a number of countries, such as Russia, Bolivia, Venezuela, Eritrea... have said to US spooks masquerading as aid in their country. False aid some folks call it. 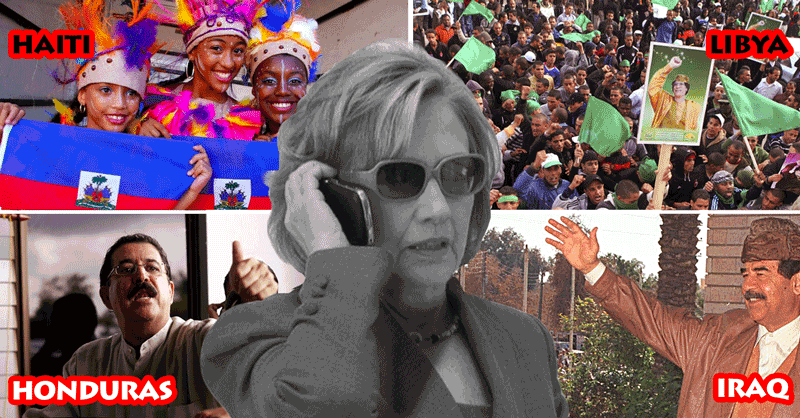 In Haiti it is a major issue (see here, here and here). The headlines say its the end of foreign aid as we know it... "President Donald Trump’s vow to put “America first” includes a plan to drastically cut assistance to developing countries and merge the State Department with USAID, according to an internal budget document and sources. The administration’s March budget proposal vowed to slash aid to developing countries by over one-third..."
This is Orwellian doublespeak of course, because the plan has always been to "put America first." 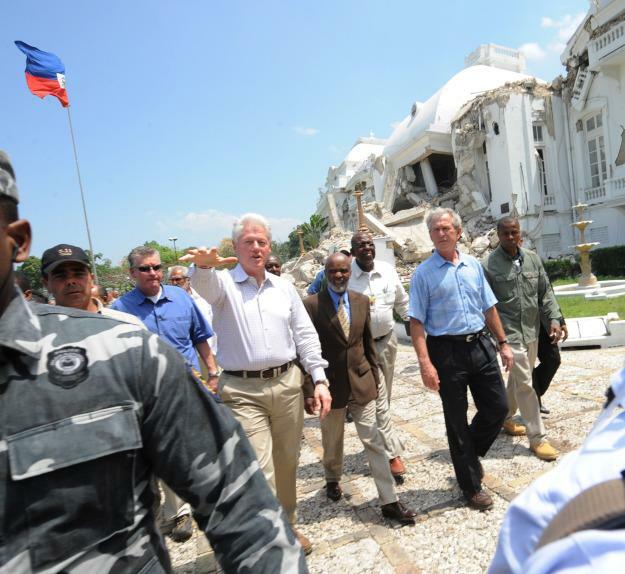 "Is USAID Helping Haiti to Recover, or US Contractors to Make Millions?" America first is the plan. It's working just as it was designed to. What do you have to add to that Candidate Clinton? –William Jefferson Clinton in his 1991 presidential announcement speech. .. and America is not great. You don't get an "A" for originality, because Ronald Reagan used it as his campaign slogan (perhaps foreshadowing Iran-Contra, Grenada war(! ), the delayed AIDS response debacle, scapegoating Black women as welfare moms, tax hikes...). 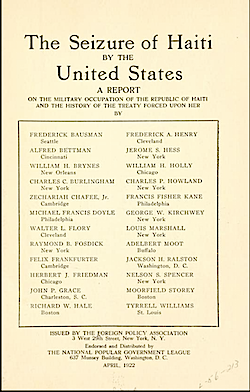 Evidently, American presidents have a major problem with other countries acting in THEIR national interest though (Iraq, Afghanistan, Libya, Yemen, Syria, Palestine, Venezuela, Haiti, Honduras, Iran, Somalia, Rwanda, Ivory Coast, ... this could go on for a while). One could argue that Saudi Arabia and America have a lot in common, seeing as how they both like a good decapitation strategy. 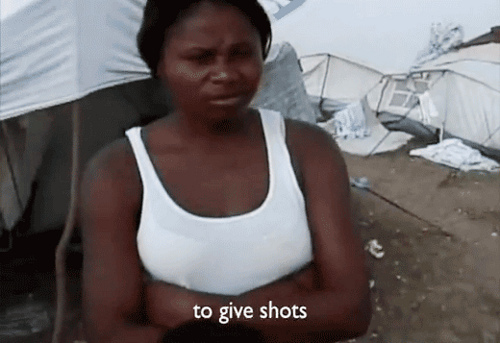 The Red Cross bought them tainted water during a UN initiated cholera epidemic. Cross delivered unpurified water that made the people sick. USAID being stripped of funds would be wonderful news for the impoverished global south. It would necessitate the immediate building of sound infrastructure and hopefully speed development; were it true. Alas, this is not the desire of the deep state establishment and Donald Trump has done a number of 180's in his stands so far; no withdrawal from Afghanistan being one. As campaign rhetoric is often just that; this is to be expected. A note to whoever may be planning a "decapitation" (Kathy Griffin, Brad Sherman... ), had you thought maybe President Donald Trump is actually not the right head? UN/USAID/World Bank are the three-headed hydra monster representing the corporatocracy in Haiti. What a headache to be aided to death by these thieving aid agencies? They do the exact opposite of what they are supposed to do, which is end the need for their services. The old saying goes: "teach a man to fish", but these poverty pimps only take away the ability of a country to produce enough food to feed its people and replace it with a cycle of aid dependency. When there is an end to this type of headline: "Canada Buys a "Lead" Role On Haiti Recovery Team;" we can look forward to a world where the miserable business of impoverishing a people is not profitable to foreign governments, who come to speculate and bid on men, women and children's sad existence as pawns in a global game of unbridled greed in the name of vulture capitalism. "It's hard enough for today's citizens to figure out what our western governments are really doing in the world, so just imagine being a target of their policies overseas. When programmes branded as "aid" can cause serious harm, and their failures are blamed on the would-be recipients, confusion is sure to ensue... In this light, the aims of Washington or London can be as inscrutable to a vulnerable, crisis-racked country as the intentions of a half-seen cat are to a mouse." USAID is a poverty pimping US government secret service operation to uphold corporatist "interests." The goal is for local government to lose control of vital public services, agriculture, electricity, water, construction, manufacturing, telecommunications... anything that will may have the ability to put money into the local economy and empower that country's leadership is sucked away, thus making them dependent on the predator economies of the global north and their pimps. Chemonics is a subsidiary of ERLY Industries, which is also the parent company of American Rice Inc. American Rice was perhaps the largest benefactor of the influx of "Miami rice" in the 80s and 90s in Haiti, wiping out thousands of Haitian farmers who could not compete with the cheaper, subsidized imported rice. American Rice Inc. officials were found to have paid bribes in 1998-1999 to custom officials in order to avoid import tariffs (already by then some of the lowest in the hemisphere due to IMF and World Bank policies). Chemonics has close ties to USAID, and relies on government contracts for over 90% of its revenue. "... But Chemonics, whose contract with USAID explicitly states that decisions about what programs to fund “will be based upon US foreign policy interests in consultation” with the State Department, worked to further USAID’s objectives of “counter[ing] the destabilizing effects” and the “growing discontent” with the pace of reconstruction. They ran PR for the new industrial park, installing benches and flower planters in nearby areas to “project a positive image.” An audit later noted that the flowers soon died “from lack of care,” while the mayor decried the lack of community involvement. But business was good for Chemonics, whose CEO at the time received a $2.5 million bonus." 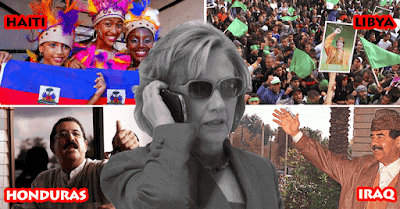 In Haiti, the US orchestrated two coups against the democratically elected government of Jean-Bertrand Aristide forcing their neoliberal agenda of privatization of all public industries and services. 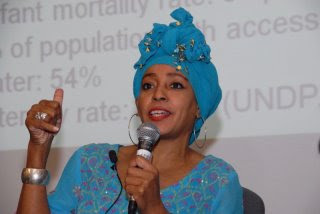 They bring in their poverty pimps to provide services that the "failed" Haitian government is unable to... no matter that they targeted that government with sanctions, boycotts, opposition groups, thugs, assassins... whatever means necessary to bring about the so-called "failure" of "socialism." Is it socialism, communism or a dictatorship when they destroy a country... they are interchangeable terms used by these fascist; a distraction from their role in destroying a country; bringing war, chaos and death, while promising that capitalist predators, central banks, foreign control will bring back order. Ezili Dantò calls this neoliberal nazi raid and plunder technique "playing arsonist and firemen." They actually have reached their goal when a country can be declared a "failed state"... if there wasn't anything to fix, there wouldn't be any money to be made and they're influence would be negligible. very telling for those trying to understand foreign aid – and its younger, hipper cousin, investment. Clinton told the audience: "Our problems have never respected dividing lines between global economics and international diplomacy. And neither can our solutions." 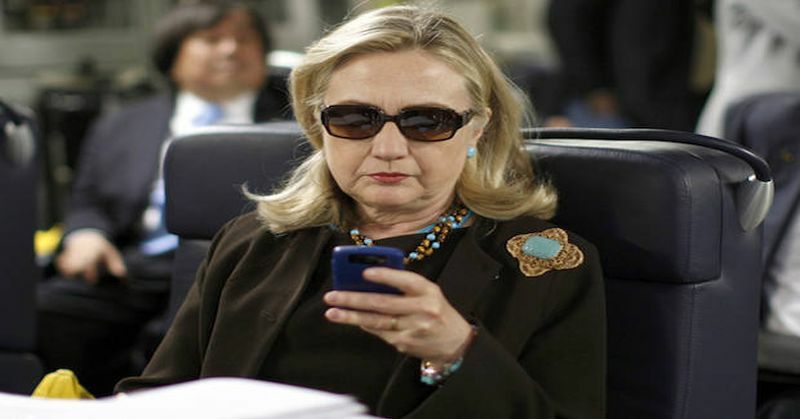 That is why, she explained, she has put "economic statecraft" at the heart of the US foreign policy agenda. Clinton further defined how the US can use "the forces and tools of global economics" to bolster American "diplomacy and presence" abroad and to strengthen the economy at home. She argued that America should "put economics at the center" of its foreign policy. In foreign relations, the question should always be "how will this affect our economic growth?" A superpower such as the US would, of course, always consider its domestic interests, especially economic ones, when it acts abroad." They project their destructive naked greed for power and control on their victims. Venezuela is going through a stage of globalist terror that happened in Haiti in 1990 and again in 2004. 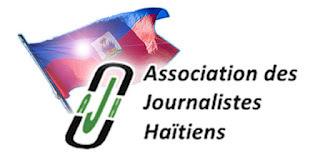 Haiti is a proving ground for most terror tactics before they go global south, with the help of the corporatist media and their millionaire news anchor stenographers. 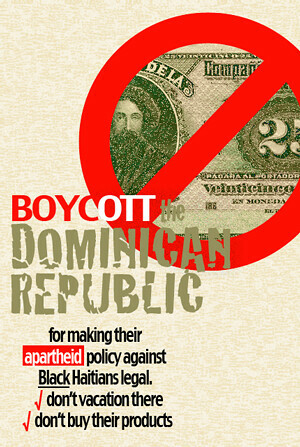 Unfortunately, during these interventions, occupations, US intelligence financed death squad (FRAPH) cleansing of political opposition, bio-terrorism (UN cholera, USAID vaccines/"birth-control"/expired medicines... ); some have even found convincing evidence of weather manipulation and earthquake's from either frakking or HARPP (Venezuela and Russia both say the 2010 Haiti earthquake was man-made). Turns out, Hillary Clinton was a great strategic choice by Barack Obama for his Secretary of State given her experience in rigging elections. Obama named Bill Clinton the UN "special envoy" to Haiti in 2009 and and after the devastating 2010 Haiti earthquake, Clinton was teamed with George W. Bush to form the Clinton Bush Haiti Fund because of all the special things he'd done for Haiti... i.e. "free trade reforms", destroying rice production to boost subsidized Arkansas rice farmers, mass starvation resulting from Haiti's inability to feed its people... good times. Nothing much is changing, but if the Trump administration were to actually put an end to USAID's immense reach in countries like Haiti, it could end the unrelenting, cold, and calculated cycle of misery, impoverishment and underdevelopment. Withdrawing aid could impact Haiti in a very positive way and just maybe it could make America seem kinda nice again. Is It Time To Revoke John Lewis’s Lifetime Civil Rights Hero Pass? John Lewis was a hero 52 years ago. What’s he doing nowadays with his Lifetime Civil Rights Hero pass? He’s a 14 term Atlanta congressman with nary a word to say on gentrification or the privatization of schools, roads, nature and the commons. He’s a pacifist with a US Navy ship named after him who votes for the NSA, Pentagon budgets, and re-arming apartheid Israel. Now his sainthood is useful again. But to whom and for what? Is It Time To Revoke John Lewis’s Lifetime Civil Rights Hero Pass? Sheroes and heroes are people who take risks, who make great personal sacrifices to perform difficult and important duties for others. By that standard John Lewis and the six hundred who walked that bridge in Selma Alabama 52 years ago are heroes whose actions helped pass the Voting Rights Act of 1965. Let’s agree on that. But long should that hero pass last? How many years, how many decades do you get to to boast and roast and toast and coast before you need to do something else even mildly heroic to keep your status current? It’s not like Lewis has lacked new chances to serve the people this last half century. He’s represented a metro Atlanta district in Congress the past 28 years. Ruled by black mayors and the black political class since 1973, Atlanta has billed itself as “Black Mecca” though for more than half of black Atlanta there’s been little to celebrate. Black mayors have relentlessly gentrified the city, starting with the Carter Presidential Library in the 80s, the Olympics in the 90s, and after that demolition of public housing, privatization of the land under it, and the BeltLine project which steals $150 million annually from Atlanta’s public schools to build yuppie housing and shopping destinations. Marquee “development” projects have driven a six figure number of poorer black residents from the city. John Lewis never says a mumbling word about any of this. John Lewis never publicly contradicts the black Atlanta mayors who crack down on the homeless, who line up for the privatization of public property, public transit and public schools. Perhaps being a Legendary Civil Rights Hero puts him above all that. Supporting Hillary Clinton last year, Lewis spoke out against free health care and free college tuition which many countries grant their young people, explaining that “free stuff” was just not the American Way. Lewis was also an early member of the Democratic Leadership Council, which irretrievably locked that party into subservience to its one percenter donors. Sometimes members of Congress can undo historic wrongs. Lewis blew one such chance when he doubled down upon the expulsion of the descendants of black freedmen from the Cherokee nation in which they had once enjoyed voting rights. John Lewis calls himself a pacifist and never misses a chance to lecture on the supreme utility of nonviolence. But the US Navy is building a ship with his name on it, a “fleet replenishment oiler” to resupply warships on deployment. Isn’t this an “honor” a pacifist should reject? And shouldn’t our Apostle of Non-Violence vote against every arms giveaway, sale and Pentagon budget? John Lewis doesn’t. Like most other members of the Black Caucus Lewis votes to fund mass surveillance and re-arm the apartheid state of Israel with depressing regularity. It’s time to ask whether Civil Rights Hero status from 52 years ago is really enough to cancel out or ignore all this, and what purpose John’s Hero status serves today. 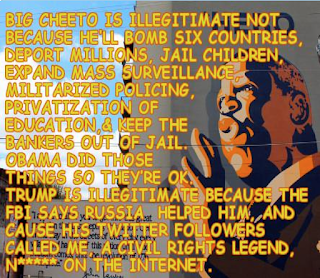 John Lewis is in the news now because he called Big Cheeto’s presidency “not legitimate.” But why? Is it because Lewis fears Trump will pursue more than 6 bloody wars, that he will deport millions of innocents, expand mass surveillance and militarized policing? 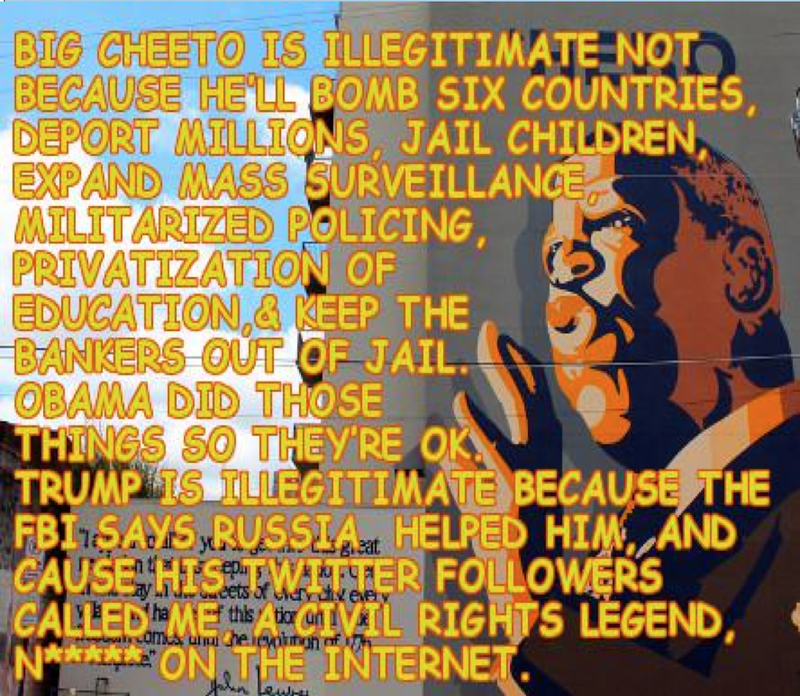 Is it because Lewis knows the Donald will help greedy banksters stay ut of jail and he’ll enable hedge fund parasites to gentrify, plunder and privatize public education, nature and the commons? Probably not, because these are all Obama policies which Trump is expected to double down on. John Lewis’s problem with Trump is that the CIA and FBI, which helped assassinate King and cover it up says that Russia helped elect him, and Lewis believes it. Big Cheeto did a Twitter fight with Lewis the other day and some of his followers called Lewis the n-word. So now the Obama/Hillary liberals are flogging John Lewis’s tattered sainthood as hard as they can, to have a #NotMyPresident message that draws attention away from the many matters on which Republicans and the Obama/Hillary liberals agree. The old Civil Rights Hero does not oppose Trump for any reason which might lead to questioning past, present or future Democrats. Lewis is warming up the crowd for Obama’s exit and the entrance of whoever the Democrats run next. This is what happens when there is no time limit on those Legendary Civil Rights Hero credentials. Time to revoke them. For Black Agenda Radio, I’m Bruce Dixon. Find us on the web at Black Agenda Report dot com, or follow us on Twitter @blkagendareport. Thanks for listening. Bruce A. Dixon is managing editor at Black Agenda Report and a member of the state committee of the GA Green Party. He lives and works near Marietta GA and can be reached via email at bruce.dixon@blackagendareport.com, or via Twitter at @brucedixon.